MOVEit Managed File Transfer (MFT) software is used by thousands of organizations around the world to provide complete visibility and control over file transfer activities. Assure the reliability of core business processes and the secure and compliant transfer of sensitive data between partners, customers, users and systems with MOVEit. MOVEit's flexible architecture allows you to choose the exact capabilities to match your organizations specific needs. MOVEit Transfer enables the consolidation of all file transfer activities to one system to ensure better management control over core business processes. It provides the security, centralized access controls, file encryption and activity tracking needed to ensure operational reliability and compliance with SLA, internal governance and regulatory requirements. MOVEit Automation works with MOVEit Transfer or FTP systems to provide advanced workflow automation capabilities without the need for scripting. MOVEit Automation accelerates the rollout of new services and the onboarding of new external data sharing partners by reducing development time while significantly reducing the likelihood of errors. Our MFT-as-a-Service offering provides full security, reliability and compliance of MOVEit Transfer with the convenience of a cloud-based service. MOVEit Cloud is auditor certified PCI, and HIPAA compliant. Providing the same advanced security controls as MOVEit Transfer, it ensures GDPR compliance in external file transfer activities involving personal data. Secure Folder Sharing provides internal and external end users with an easy-to-use, drag-and-drop collaboration capability as an alternative to using email or consumer-grade EFSS to share sensitive data. Deployment flexibility means you can meet your exact needs with options ranging from MFT-as-a-Service, to public cloud to on-premises or hybrid cloud solutions. 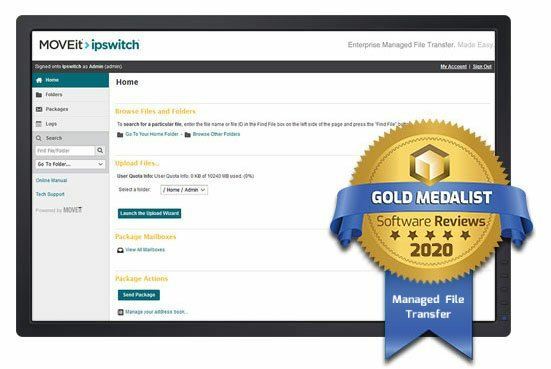 Ipswitch Analytics streamlines compliance reporting and audit preparation with automated reporting of tasks, workflows and file transfer activities from MOVEIt Automation and MOVEit Transfer. The MOVEit Mulesoft Connector supports the integration of managed file transfer capabilities with any application supported by Mulesoft’s iPaaS solution. Neverfail Failover Manager delivers zero downtime with failover to secondary and tertiary servers to maximize file transfer availability. MOVEit Ad-Hoc makes secure file transfer easily accessible from Microsoft Outlook or a web browser to assure the compliant ad hoc transfers of sensitive data. Our Multi-tenancy option enables MOVEit Transfer to simultaneously serve multiple client organizations, or “tenants”, on a domain or username basis. 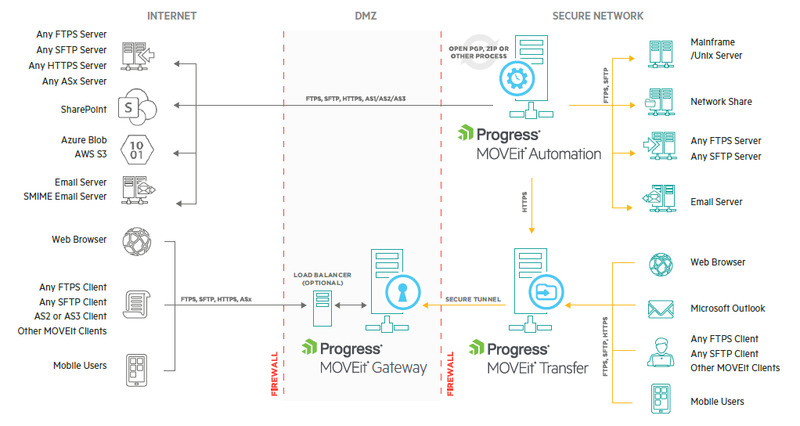 MOVEit Transfer has a flexible architecture that can be deployed on one or more systems to address availability, performance or scalability requirements. From WS_FTP Professional with over 40 million users, to MOVEit EZ and MOVEit Freely, Ipswitch has a full range of desktop clients to meet your needs. The MOVEit API offers third-party programs access to a wide variety of MOVEit Transfer and MOVEit Cloud services and administrative capabilities. MOVEit Mobile enables mobile workers to reliably and productively participate in file-based business process workflows. "We used basic Microsoft tools until new requirements meant we needed a secure, enterprise-class solution. MOVEit file transfer more than meets that need and allows us to deliver end-to-end data encryption, administration and reporting." "We’re very happy with MOVEit. It scales really well, especially as we grow into a multi-affiliate organization with different people from different organizations getting access to the tool. The central security model lets us delegate tasks to certain groups of people, and that’s really helping us out." "Before we had MOVEit in place, we didn’t have a data transfer security standard that everyone followed. In essence we were left making decisions as to what was sensitive to the end users. I was uncomfortable with that level of security." Learn how to select the right file transfer solution to meet your organizational needs. Learn how to assure your file transfer servers aren't the launching pad for a ransomware attack. Build a healthy and collaborative business environment while also embracing the best practices in data security. Learn how MOVEit helps IT teams assure file transfer compliance with regulations like HIPAA, PCI, GDPR and more.